Modern life has its pros and cons. We may be blinded at times by the many advancements we now enjoy and has made our lives easier but it is not always a walk in the park. As addicted and happy we are with our modern trinkets, there are certain aspects of our lives that are compromised because we fail to see the dangers some of these technologies may have. The first thing that comes to mind is smart gadgets that got everyone hooked to 24/7. Whether you are young or old, it is hard to resist the lure of technology. The hours fly by and you don’t even feel bored anymore with the countless apps you can tinker with all day and all night. Even adults get distracted by it and it affects their productivity and performance much more young kids who don’t haven’t really gotten a good grasp of what’s right from wrong. Kids these days have greater access to technology. After all, these devices are all over your home. From home and entertainment appliances, many of them easily connect to the web and enables you to do more than previously. We can no longer hide from the Internet of Things. And the smarter these gadgets have become, the more challenging it is to get away from it and try to lead a normal life. Technology is meant to help us and not be a burden. So, kids who can freely use these devices on their own with little parental guidance, we are starting to realize the dangers it poses not only to their health but to their mental and emotional well-being as well. Children get addicted to games and watch videos for hours on end that they neglect their physical health since they mostly stay cooped up in their bedrooms and not going out anymore and mingling with their peers. A new study by the New York City Health Department finds a link between inadequate sleep and poor mental health among children and adolescents. The study found that on an average school night, 75 percent of high school students reported getting fewer than eight hours of sleep, and 11 percent of school children (ages 6 to 12 years) got inadequate sleep (less than nine hours). A link between less sleep and excessive screen time in school children was observed. The study of New York City school children and public high school students found lack of sleep was associated with emotional and behavioral problems in children, and depressive symptoms in adolescents. 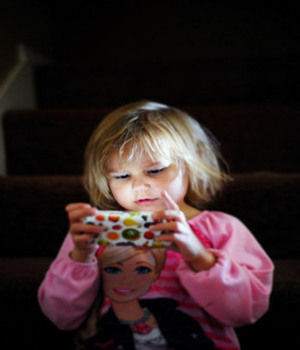 What’s worse about tech addiction is that it deprives children of their sleep. They don’t sleep right away after being tucked into bed but sneak a few more hours of unguarded screen time whether they are playing games or browsing their social media news feed. Their #FOMO keeps them obsessed in finding out all the latest trends so they can keep up with their friends who apparently do the same thing as them, which is to devote their free time to their gadgets and living in their virtual bubble that it can be stressful at times especially if they are seeing or get exposed to things that they shouldn’t see yet at their young age. As children and young people spend an increasing amount of time with screens – more than six hours a day according to one US survey – parents have begun to wonder if spending this much time with screens is safe. An increasing amount of research suggests it is not. Teenagers who spend five or more hours a day on electronic devices are 71% more likely to have a risk factor for suicide than those who spend less than an hour a day. Young people who use screens this much are also 52% more likely to sleep less than seven hours a night – a significant amount of sleep deprivation with potential consequences for both physical and mental health. The more time young adults spend on social media, the more likely they are to be depressed or lonely. Both a child’s physical and mental health deteriorates if you let them go overboard with technology. It is the parent’s responsibility to curtail their access and even turn off the WiFi at home if it’s what it takes to stop them from overindulging in this modern luxury. You don’t even have to wait for these kids to grow bigger to see the impact of excessive technology use on them. They become more sickly and obesity has risen dramatically as we all adopt a more sedentary lifestyle. Cyberbullying has become a big issue and it has crippled children from reaching their fullest potential because they are deeply hurt and traumatized by the hate they may have received online, and at times their parents are not even aware of what their kids have to go through on their own as they get too immersed especially in social media. What medical experts have noticed is that sleep, or better yet the lack of it, is a big factor to the many difficulties faced by the younger population. If their sleepless state is of their own volition, then you definitely have to do something about it and stop them from nurturing a deadly habit while they are still young. If it is caused by something outside of their power like a sleep disorder, for instance, such as sleep apnea, they need medical intervention and they may even have to use CPAP in their sleep when necessary. Unfortunately, CPAP isn’t the ideal management for many https://snoringmouthpiecereview.org/why-a-cpap-machine-is-probably-not-for-you. If your youngster can’t tolerate the bulky machine, then https://snoringmouthpiecereview.org/zquiet may work as this is handy yet still addresses the breathing gaps by opening the airway without being strapped to a bothersome device such as CPAP.